"They only live to get radical"
"Point Break", is an action movie staring, Patrick Swayze and Keanue Reeves. The story set in California, is about an FBI agent who goes undercover to find some notorious bank robbers who go by the name, "The Ex Presidents". They are called the Ex Presidents because of their masks of former presidents of the United States. These robbers are trained professionals; they go into a bank, rob it quickly, and never go the volt, so they are in and out before the cops arrive. The movie opens with an old and weary cop named, Pappas being assigned a new partner, Johnny Utah, fresh from school. Pappas resents being given a partner, and he and Johnny clash at first. Pappas learns to trust Johnny and tells him his theory about the Ex Presidents. He thinks they are suffers, and that is why their crime patterns seem to have no reason to them. Pappas sees their patterns following the surfing season, and is sure he can find them, if only they could get close to them. Johnny decides to take up suffering and nearly gets himself killed in the process. While surfing he meets a pretty, young girl named, Tyler, and she leads him into her world and to the Ex Presidents. There Johnny meets Bodhi, the leader of the surfing group and as the audience learns later, the Ex Presidents. Bodhi and Johnny become real close, they start to trust one another, and Johnny starts to forget that he's supposed to find where the Ex Presidents are. Bodhi finds out who Johnny is and kidnaps Tyler and has her gagged to get Johnny to help the presidents rob another bank. During the bank robbing, something goes wrong, and guns are fired. Bodhi escapes with Johnny in an airplane where the two of them skydive, and Johnny has to go after him without a par shoot. "Point Break" is filled with lots of great action shots, and intense emotions. The film's director is a woman, Kathryn Bigelow who would later go on to direct Oscar winning movies. Point Break is currently available to watch and stream, buy on demand at Amazon, Vudu, Google Play, FandangoNow, iTunes, YouTube VOD online. "Dirty Dancing" and "Red Dawn" are all being revisited soon, so why not go for a Swayze triple-play? 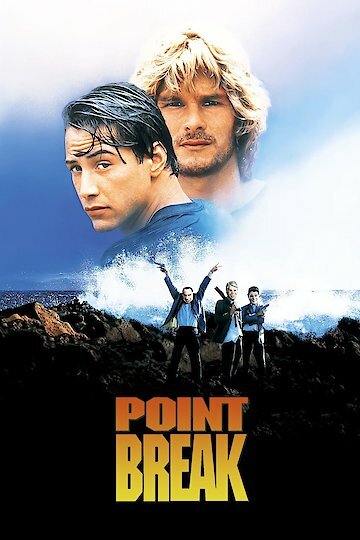 No, we're not talking about "Roadhouse" (though that give us an idea...), we're talking about "Point Break," the classic surfing bank robber flick starring Patrick Swayze and Keanu Reeves.